On October 25th, 1942, then Archbishop Aloysius Stepinac commented on racial acceptance: We affirm then that all peoples and races descend from God. In fact, there exists but one race. The members can be white or black. They can be separated by oceans or live on the opposing poles, but they remain first and foremost the race created by God, according to the precepts of natural law and positive Divine law as it is written in the hearts and minds of humans or revealed by Jesus Christ, the son of God, the sovereign of all peoples. Aloysius Stepinac was the cardinal of Croatia who was imprisoned by the communists, held under accusations of being pro-Nazi, and poisoned. He was born on May 8th, 1898 in the village of Krasic, Croatia, near Zagreb. Since it was then part of Austria-Hungary, he was drafted into the Hungarian army in WW I. There he was wounded and by 1919 he had earned several medals for valor. In 1924, he enrolled in the Gregorian University in Rome to prepare for the priesthood. He earned doctorates in philosophy and theology and was considered a brilliant student. He was ordained in 1930 and rose rapidly in the church due to his reputation for piety, administrative ability and friendship with the Papal Secretary of State, Eugenio Cardinal Pacelli, later Pope Pius XII. 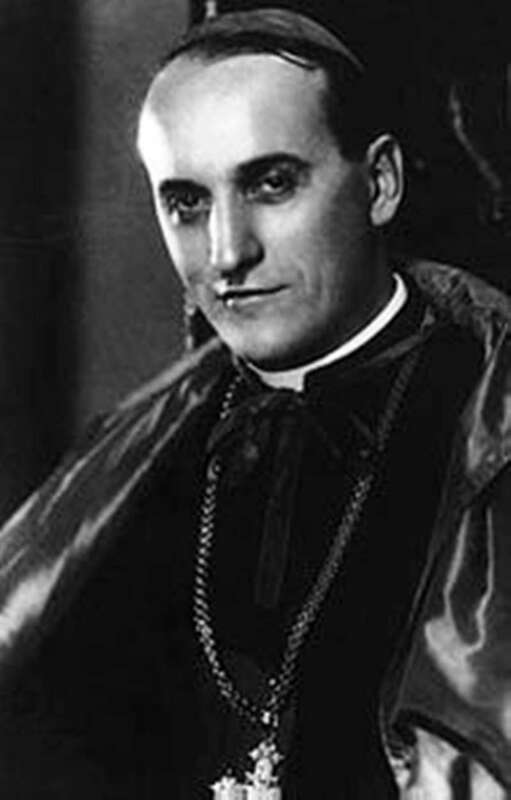 In 1937, at the age of thirty-eight, after several appointments, he became the Archbishop of Zagreb, one of the youngest archbishops in Roman Catholic history. In 1941, Croatia declared itself an independent state. In reality they were considered a puppet ally of Germany under the fascist (Ustasa) regime of Ante Pavelic. Stepinac was a Croatian patriot and he accepted the government and exhorted his clergy and the laity to do the same. There is controversy surrounding this government and some of the Archbishop’s actions connected to it. However, his defenders insist that at great personal risk to himself he denounced the barbarous Nazi practices. They insist that he never condoned any forced conversions of Orthodox Christians or the massacres of Serbs, Jews and Slovenes. The artifact shown here is the only signed item Father Kunst has from a martyr of the church. 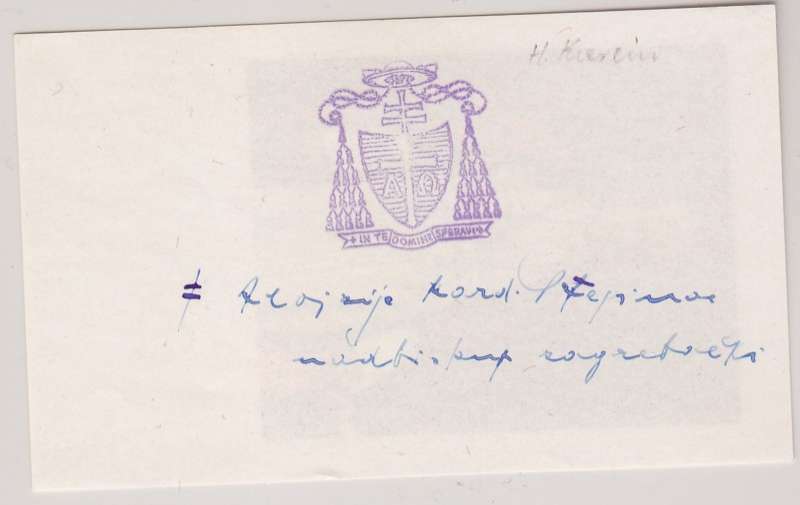 It is a holy card with an ink stamp of Blessed Aloysius Stepinac’s (1899-1960) coat of arms and his signature beneath it. When a Communist state was set up in Yugoslavia, Stepinac openly denounced Communism. He was arrested, imprisoned and later released. He continued to denounce Communist practices and was then arrested again, accused of war crimes and sentenced to hard labor, a sentence that was not enforced. Upon his release from prison, he was restricted to Krasic and he served as a parish priest to about 400 people. In 1952, Pope Pius XII elevated Stepinac to the cardinalate. He did not go to Rome for the investiture ceremony, knowing he would not be permitted to return home. He died on February 10, 1960, and his tomb in Zagreb is a place of pilgrimage. Cardinal Aloysius Stepinac was declared a martyr, having been slowly poisoned while in prison. Pope John Paul II beatified him on October 3, 1998. The following information is used with permission of the Vatican Information Service. VATICAN CITY, 5 JUN 2011 (VIS) – After taking his leave of the apostolic nunciature, the Pope travelled to Zagreb’s Cathedral, dedicated to the Assumption of the Blessed Virgin Mary and to St. Stephen I of Hungary, where he celebrated vespers with the bishops, priests, religious, and seminarians. This evening, the Holy Father said in his address, we gather for a devoted and prayerful remembrance of Blessed Aloysius Viktor Stepinac, a fearless pastor and an example of apostolic zeal and Christian fortitude, whose heroic life continues today to illuminate the faithful of the Dioceses of Croatia, sustaining the faith and life of the Church in this land. The merits of this unforgettable bishop are derived essentially from his faith: in his life, he always had his gaze fixed on Jesus, to whom he was always conformed, to the point of becoming a living image of Christ, and of Christ suffering. Precisely because of his strong Christian conscience, he knew how to resist every form of totalitarianism, becoming, in a time of Nazi and Fascist dictatorship, a defender of the Jews, the Orthodox, and of all the persecuted, and then, in the age of communism, an advocate for his own faithful, especially for the many persecuted and murdered priests. Yes, he became an advocate for God on this earth, since he tenaciously defended the truth and man’s right to live with God. 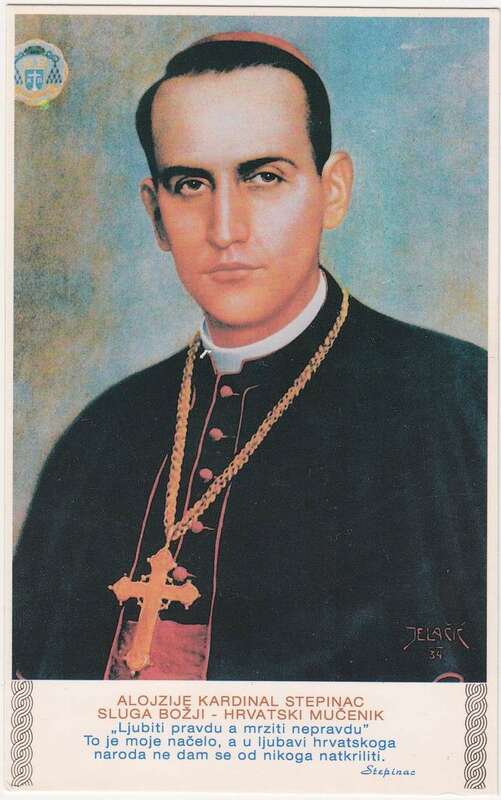 Blessed Aloysius Viktor Stepinac responded with his priesthood, with the episcopate, with the sacrifice of his life: a unique ‘yes’ united to that of Christ. His martyrdom signals the culmination of the violence perpetrated against the Church during the terrible period of communist persecution. Croatian Catholics, and in particular the clergy, were objects of oppression and systematic abuse, aimed at destroying the Catholic Church, beginning with its highest Authority in this place. That particularly difficult period was characterized by a generation of bishops, priests, and religious who were ready to die rather than to betray Christ, the Church and the Pope. The people saw that the priests never lost faith, hope, and charity, and thus they remained always united. This unity explains what is humanly inexplicable: that such a hardened regime could not make the Church bow down. 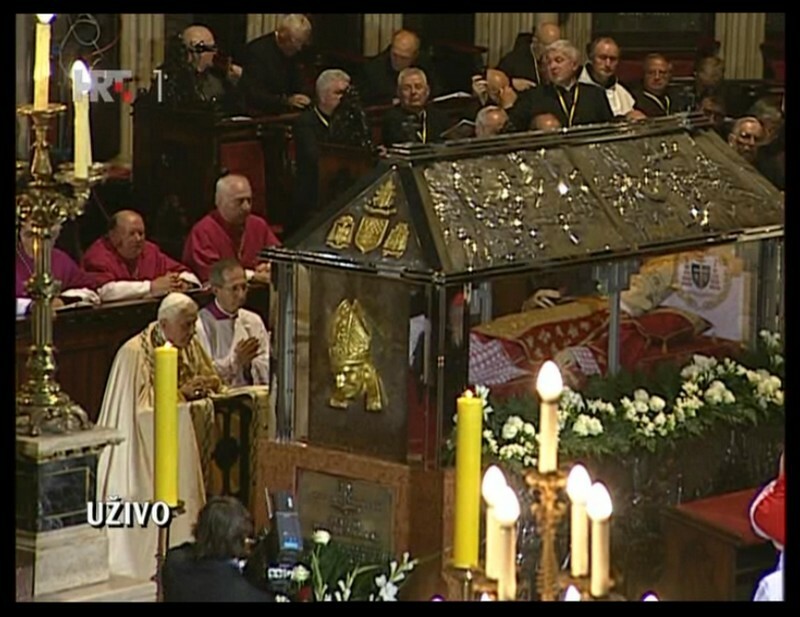 At the end of the celebration, Benedict XVI prayed at the tomb of Blessed Stepinac.